The instruments I make are normally of two useful sizes: 22 and 25 tubes. I also make bigger and smaller ones, (15 or 29) but they are mostly for either beginners or very advanced players. Any custom size is also available. 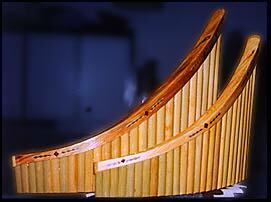 They are professional quality, European curved style, with Chinese bamboo tubes, and ends, and a wooden base section. They are tuned with wax, oiled on the inside and varnished outside. The lower notes are on the player's right. A reverse instrument is possible if desired, at no extra charge. A twenty-two and a twenty-five tubed pan flute. These two are the normal style I make, natural wood colour with some inlaid (marquetry) decoration. They are in a normal diatonic major scale Do re mi fa so la ti do. This of course also gives the relative minor easily. The traditional tuning is in G major, but C major is the other common choice. For a C major large pan flute, I recommend 26 tubes. This goes down to a low C. The 25 tubed one goes to a D. The G instrument is best for Romanian music, and the C perhaps better for popular music, or classical. For a jazz player I have made custom pan flutes that are chromatic, and one that plays an E flat minor scale, so really, any tuning is possible. The twenty-two tubed one is perhaps the most common pan flute size, and the 25 or 26 adds a few lower notes, which is perhaps best for the long run. They go equally high. A bass 22 tubed pan flute. This is one octave lower than the standard 22. Great if you love those low notes! The 22 tube alto (3 octave G-G-G longest tube about 9 inches) costs $350 U.S. The 29 bass=$625 U.S. This is the largest I make. The standard 22 starts on G and goes up three octaves to a high G. The 25 starts on a D and goes up to the same high G. The 29 starts on a G and goes up four octaves to a high G.
Other sizes are available, and large tubes cost more than small ones. A 44 page book is $10, but is only for the C pan flutes. It is free with any pan flute. There is a $2 shipping charge for the book alone, and a shipping charge for the pan flutes, depending on how fast you want it delivered, how big it is, and where you live. This actual shipping cost can range from $15-$150. I do not charge for "handling". Detail of a nicely shaped edge. Realistically, I leave several weeks for making a new one, as I have to let glue and varnish dry thoroughly, and make sure everything is stable. Thanks for visiting! And feel free to ask any questions. You can write to me in English, Spanish, or French.